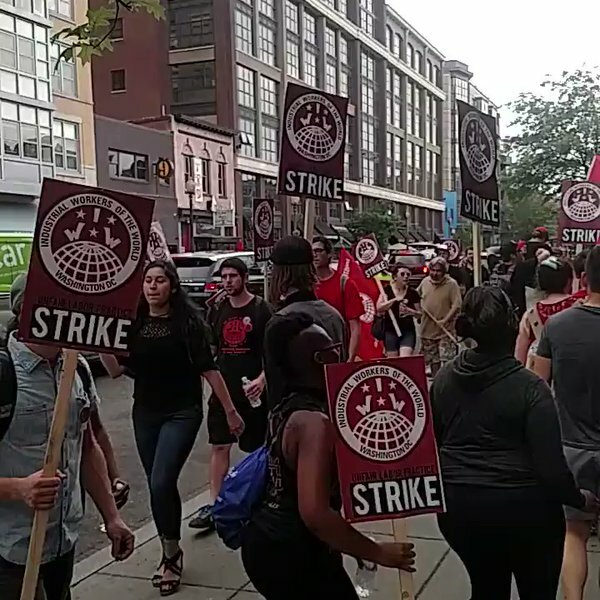 On the 30th of April, the IWW showed up at the Whole Foods on P st, demanding reinstatement of a worker named Julia who was fired for union organizing activity. In addition to the picket, someone dropped a banner with the same demand on it. In an ugly development, alt-right(neo-Nazi) organizer Mike Cernovich showed up, posting photos to his Twitter account. 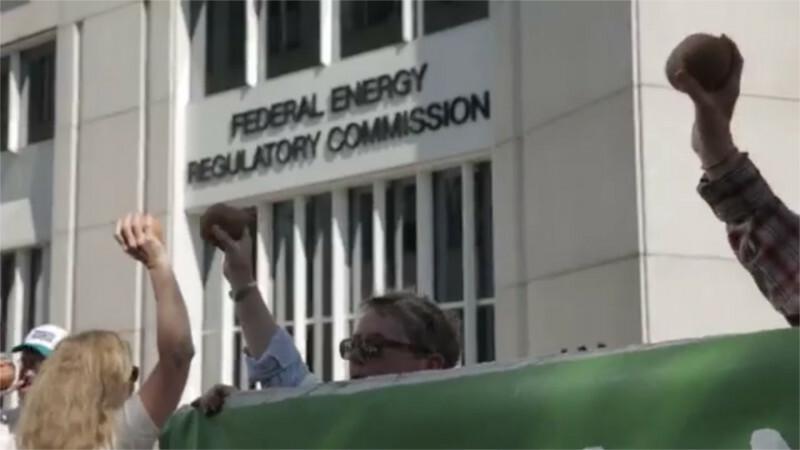 On the 28th of April, Beyond Extreme Energy showed up at the offices of FERC, the Federal agency that issues permits for oil and gas pipelines that make eminent domain possible. FERC currently lacks a quorum due to vacancies and is shut down, but that does not stop already approved projects. The April 28th protest featured sweet potatoes, as Atlantic Coast pipeline threatens to severely harm N Carolina's sweet potato farmer, many of whom are on the route and facing eminent domain. On the 29th of April, the huge People's Climate March succeded in putting a ring of protesters all the way around the White House. At 15th st, part of the march went North and around the White House before going back down 17th st to the Monument grounds. Another part went south directly to Constitution Ave, thus closing the ring around the White House. One report credited the march with exceeding Trump's inaugural spectator turnout. What: May-Day Anti-Capitalist Bike RideWhere: Starting at Petworth Ave Metro Station and ending at Malcolm X parkWhen: Starting at 11:30am, ending around 1:15pmWho: You!! !Why: Why? Because we have nothing to lose and everything to win! Another world is happening! 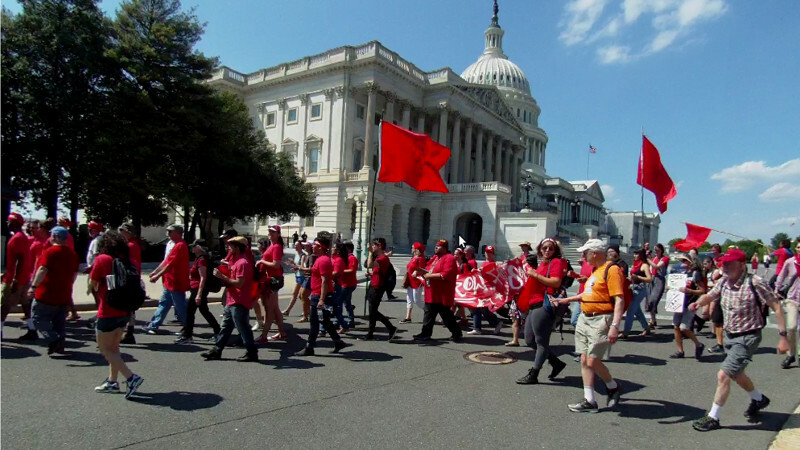 Read more about May Day AntiCapitalist Bike Ride! 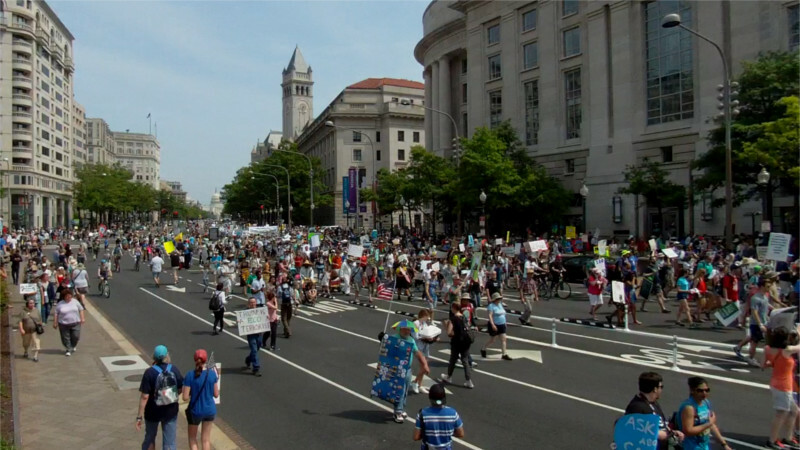 On the 28th of April, Indigenous marchers organzed by It Takes Roots declared a "red line" on climate change, pipelines, and fossil fuel extraction with a march around the US Capitol followed by a blockade of 3ed st.This was not long after an insulting remark from Trump about Pocohontas and breast size even though Pocohontas was a child raped by one or more settlers. 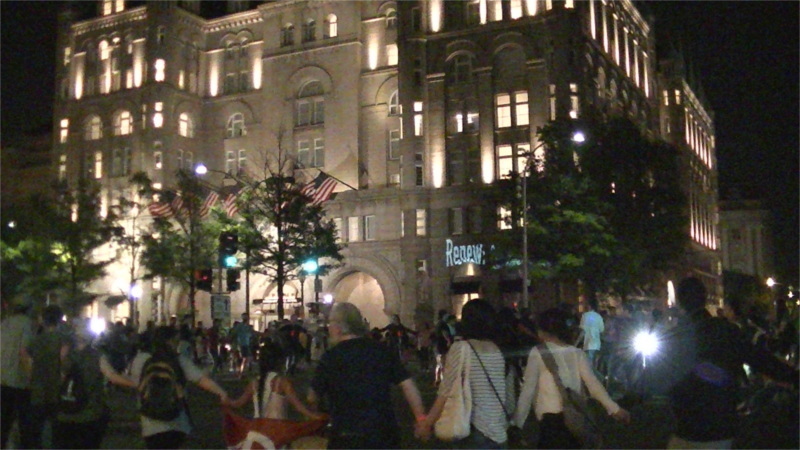 On the evening of April 27, as the People's Climate March was two days out, drummers from multiple Indigenous communities held a drum circle and round dance in front of Trump Hotel. At the climax the entire round dance took over Penn Ave in front of the hotel, blocking traffic in all 4 directions at Pennm and 12th sts. The drummers and dancers were there because of Trump's executive orders ramming pipelines through Indigenous lands, and Trumps general pro-extractive agenda too. Read more about The Shortwave Report 04/28/17 Listen Globally! 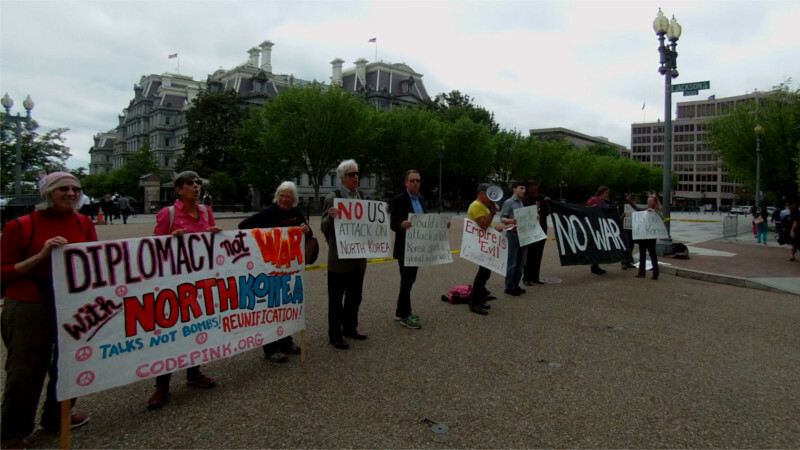 On the 26th of April, Trump summoned all 100 US Senators for a conference generally believed to be about a potential war against North Korea. The dictator of N Korea and wannabe dictator of "North America" have been in a situation best compared to an escalating fight in a crowded restaurant between two heavily-armed, violently psychotic Mafia dons. As protesters set up to denounce the brewing war, the police closed or claimed to close Lafayette Park, as they so often do at "convenient" moments these days. On the 23rd of April, DC area antifascists held a public outreach event at GW University after a failed neo-nazi "night of the flier" did not post any of their threatened racist fliers. Neo-Nazi Jack Posobiec and one of his friends showed up and walked up to disrupt the event with shouting. Posobiec tempted a bike messenger who came to the area as part of an Alleycat ride into a fight, then had him arrested. 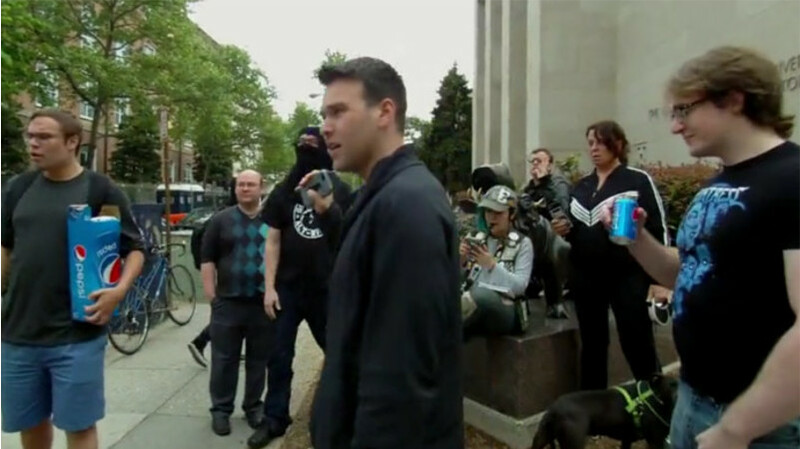 Jack Posobiec (center of picture) likes to lure people into fights, then have them arrested instead of fighting them himself. 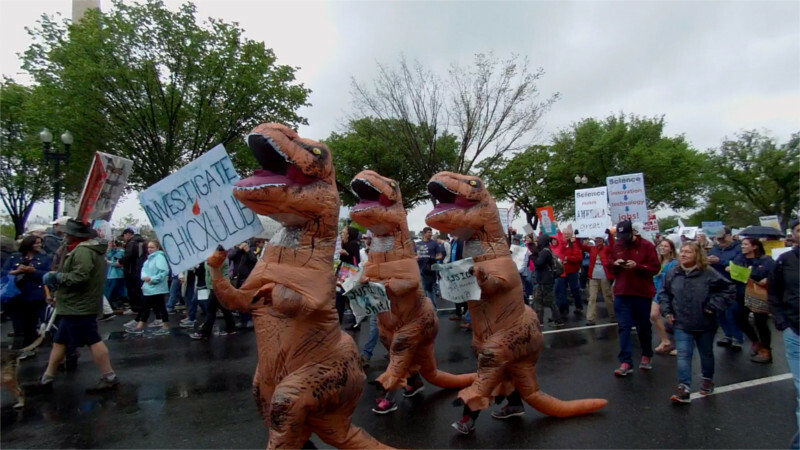 On the 22nd of April, Earth Day, Science Marches were held all over the planet to protest the "alternative facts," climate science denial, and all-around bad science spewing from Donald Trump and the rest of the far-right.DC's march too well over an hour to pass any single point, and the mainstream press spoke of "hundreds of thousands" marching all over the world. Seventeen years ago, huge numbers of protesters and a masked-up Black Bloc protested and fought against corporate power in the streets of DC.An infamous mass arrest came out of a march the day before. 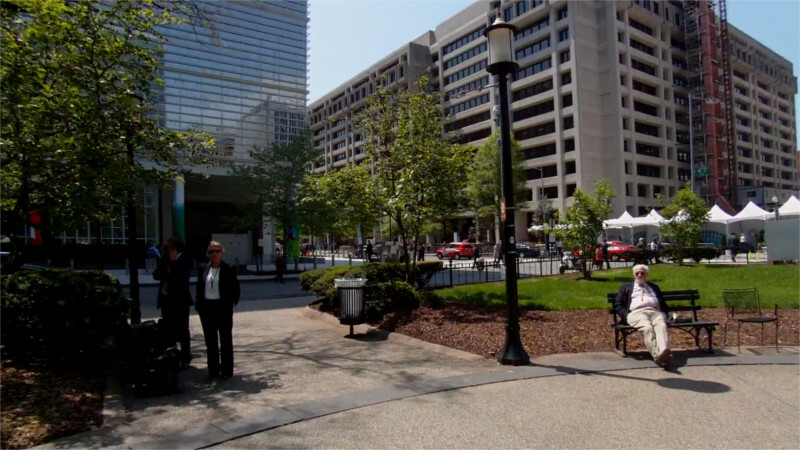 Now the IMF and World Bank are meeting this weekend, April 21-23, with their power greatly reduced. Trump however is beginning to adopt parts of their agenda, wanting to add TPP style provisions to his proposed renegotiation of NAFTA. On the 20th of April, Climate First! staged what may be the first snowflake of the coming avalanche of protests in DC against Trump's reborn Keystone XL tar sands pipeline. Two branches of Wells Fargo, one of the banks financing TransCanada were targetted. As 17th and Penn, activists got inside to deliver a letter. The second branch at 18th and K sts locked their doors.